This Cozy 3 Bedroom House sits at the 33 Mile Marker of beautiful Lake of the Ozarks. This house is appointed with one queen bed in the two main level bedrooms one of which has a private bath. The third bedroom offers a double futon and a half bath. The living room is located on the main level adjoined by a large lakeview deck, the kitchen and dining area are located on the lower level which walk out to a lakefront patio. There is plenty of space in the living room area for a couple of air mattresses. Cable TV is available on all four TVs and there is WiFi throughout. You can also enjoy the fantastic lakeview of the main channel there is a boat dock with a swim ladder for lake swimming. This house is located near Captain Ron’s, Fish & Company, Larry’s on The Lake and numerous other waterfront establishments. Other attractions nearby are Frankie and Louie’s, Bridal Cave and Ha Ha Tonka State Park. 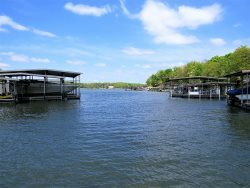 As you can see this property is perfect for your next Lake Vacation, pack your bags and come on down to enjoy all Lake of the Ozarks has to offer.